At some point on this island everyone comes across Little Qualicum Cheeseworks (http://www.cheeseworks.ca/). This includes my local farmers market. They have such tasty different cheeses (including those naughty naughty cheese curds) I just had to pick something up and do something with it. The cheese of choice this week was their berry fromage frais. So creamy, so fruity, so healthy! If you aren’t as lucky as I am you can easily substitute some berries and goatcheese in this recipe. I have done this both ways and found it delicious each time. Slice the tenderloin in half lengthwise but not all the way through. Leave about 1/2″ on the bottom. Place the pork on a cutting board and cover with a sheet of plastic wrap. Pound to 1/2″ thickness using a meat mallet or in my case since I don’t have a meat mallet…that really heavy can of beans. Spoon the fromage frais down the center of the pork. Make sure you leave about 1/2″ margin around the outside edges. 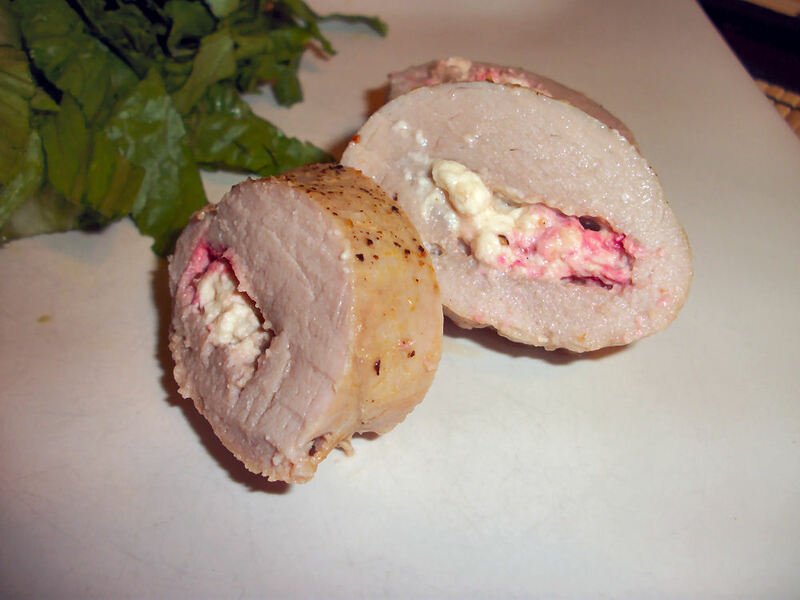 Roll up the pork from the long side like you would a jelly roll. 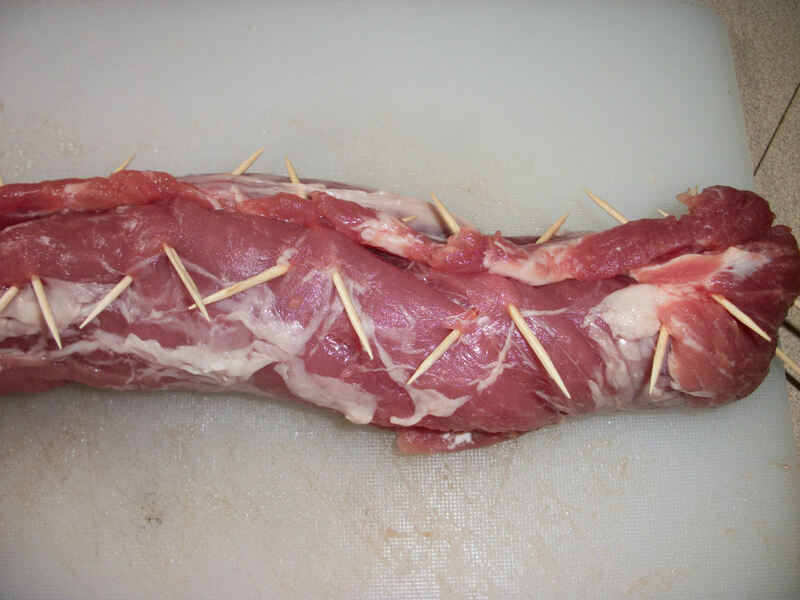 Secure the pork closed using either twine or toothpicks. My twine ran away never to be seen again so I used toothpicks: No matter how tempting do not try to pretend this is an alien bursting out of your stomach. It ruins all that hard work…not that I tried it..noooo. Place the pork on a foil lined baking pan. Spray with cooking spray, then sprinkle with the salt and pepper. Bake at 450F for 25 minutes. Allow to rest for 10 minutes, remove the toothpicks, cut into twelve slices and serve! Makes four servings of 3 slices. Each serving contains 215 calories, 8.5 grams of fat, and 2.2 grams of fibre. This can be a tasty special occasion dish or just a haha look at my leet skillz dish for when you have company. Goodtimes. This entry was posted in Dinner and tagged Cheese, Pork. Bookmark the permalink.